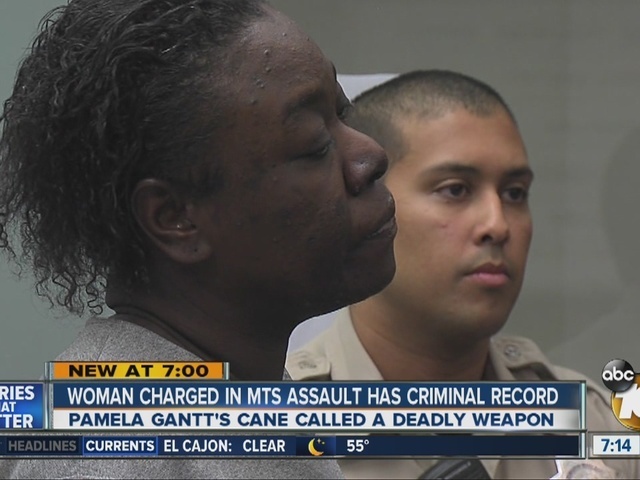 A woman accused of assaulting two men with her metal cane on an MTS bus pleaded not guilty Thursday. Deputy District Attorney Kelly Rand told a judge that 42-year-old Pamela Gantt was harassing other passengers and refused to move her cane to let a passenger in a wheelchair board the bus. When the bus driver confronted her, Rand said Gantt struck him in the arm with her cane. The driver called security, and after they arrived, cellphone video obtained exclusively by Team 10 showed them struggling to remove Gantt from the bus. After one of the security personnel used pepper spray on Gantt, the video shows her raising her cane and striking one of the security guards in the ribcage. As he fell to the ground, Gantt rushed toward him and struck him across the top of his skull. The guard was so badly injured he was rushed to the hospital with a 6-inch gash on his head. Rand called Gantt a threat to the community, saying she's on probation for a 2015 battery and that she's done prison time for making criminal threats and resisting arrest. In 2001, she was charged with assault on a federal officer, and in 1994, she was charged with extortion for threatening to injure a person in Seattle. Gantt's public defender said her client has been a resident of San Diego for 23 years. The public defender said Gantt, who has a degree in sociology, takes "a litany" of medications for various ailments. Gantt, whose bail was set at $60,000, returns to court for a preliminary hearing Jan. 28.